Published: Nov. 9, 2012 at 02:03 p.m. 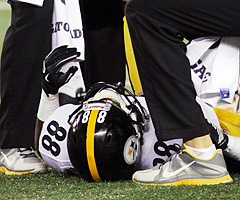 Updated: Nov. 9, 2012 at 06:37 p.m.
Faking an injury has never been so expensive. The NFL announced Friday it has fined Pittsburgh Steelers wide receiver Emmanuel Sanders $15,000 and the Steelers organization another $35,000 for Sanders' faking of an injury against the Cincinnati Bengals on Oct. 21. "Despite the account given by Sanders during our November 2nd meeting, neither the video sequence of the pertinent plays nor the observations of the on-field official support Sanders's contention that he was in severe pain, either before, while falling to the ground, lying on the ground, or when he was being assisted in leaving the field," NFL Executive Vice President of Football Operations Ray Anderson said in a letter to the Steelers general manager Kevin Colbert and Sanders. "Moreover, after missing the one play that is mandatory pursuant to the playing rules, and receiving no apparent treatment, Sanders returned to the game for a fourth down punt, on which he out sprinted all of his teammates 26 yards down the field, arriving at the ball ahead of all other Pittsburgh players, and then downing the ball. "The video of the play shows Sanders running swiftly and effortlessly toward the punted ball, and then leaving the field with no sign of discomfort. Sanders also played the rest of the game without difficulty. Finally, there is no indication that Sanders has had prior cramping issues while in the NFL, and no Steelers' medical records or information of any kind were presented that would support a finding that he incurred a cramp that was both as serious and as transient as Sanders suggests." Anderson went on to say that they don't believe Sanders had been coached to fake an injury. If the NFL believed the Steelers instructed or coached Sanders to fake the injury, the fine would have been "substantially more." We have seen similar injury faking incidents over the years, but Sanders ultimately was victim to playing on "Sunday Night Football." This might never have been noticed if it was an afternoon game between the Bengals and Cleveland Browns. The severe punishment sends a message to other teams. The NFL appears to be trying to prevent flopping and injury faking in order to avoid looking like European soccer.